Anandamela 20 December 2016 Bangla magazine ebook to pdf file. 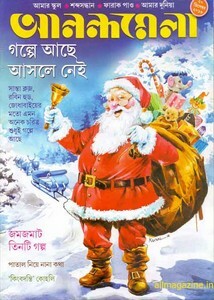 It is a very famous Indian Bangla fortnight children magazine- 'Anandamela' which is publish from Kolkata by ABP Limited. This fortnightly edition usually publish on 5th and 20th date of every month. Today I want to share with all of my dear and sweet little friends, 20 December 2016 last year edition of this magazine. The inner stories of this edition's are some famous characters in story but in fact there is no, three excellent stories, many story about the underground, legend of 'Koholi', Susmita Nag's novel Roboy, Regular section etc. From here, also you get all old edition of Anandamela.